Appartement avec terrasse, accès direct plage! grande terrasse de 150 mètres carrés, équipée solarium, où vous pourrez admirer la vue magnifique sur le promontoire de Bellagio, idéal pour les barbecues, décoration soignée, Entièrement rénové. Plage de galets, avec accès direct. Les propriétaires sont toujours disponibles pour fournir toute information ou besoin. Nous venons de rentrer de vacances passées dans cette belle région. Ce n’est vraiment pas pour leurs lancer des fleurs… mais très sincèrement leur jardin est un enchantement et sort vraiment de l’ordinaire. Merci aux propriétaires pour leur accueil et leur hospitalité au-delà de nos espérances . Nous avons passés là pour la seconde fois, un séjour très agréable. C’est sûr nous reviendrons. Nous avons passé une semaine en famille (4 adultes et 2 adolescents) dans l'appartement de Marco et Daniella. Toutes les photos sont l'exacte reflet de la réalité. L'appartement est spacieux avec un atout majeur, la terrasse. La vue sur le lac est fantastique. Prendre son petit déjeuner sur leur terrasse est tout simplement magique. La possibilité de garer nos deux voitures sur place a également été un avantage car les places de parking sont restreintes à Fiumelatte. L'accès privé à la petite plage nous a permis de nous rafraîchir en rentrant de nos journées de visite. Il a fallu s'organiser pour les passages à la salle de bain mais Daniella nous a expliqué que des travaux sont prévus pour faire une deuxième salle de bain. L'appartement est déjà génial et il sera bientôt au top! Les propriétaires sont très accueillants. Nous avons été reçu avec des boissons fraîches et des biscuits. Daniella nous a fait la surprise deux fois dans la semaine de nous laisser des pâtisseries faites maison. Nous adressons un immense merci à Marco et Daniella pour ce superbe séjour! Our stay in Varenna was so memorable. Marco and his wife were so welcoming. The place was big, beautiful and clean. The views of the lake were the best. We can’t wait to visit again. We had the most amazing time staying in Varenna. 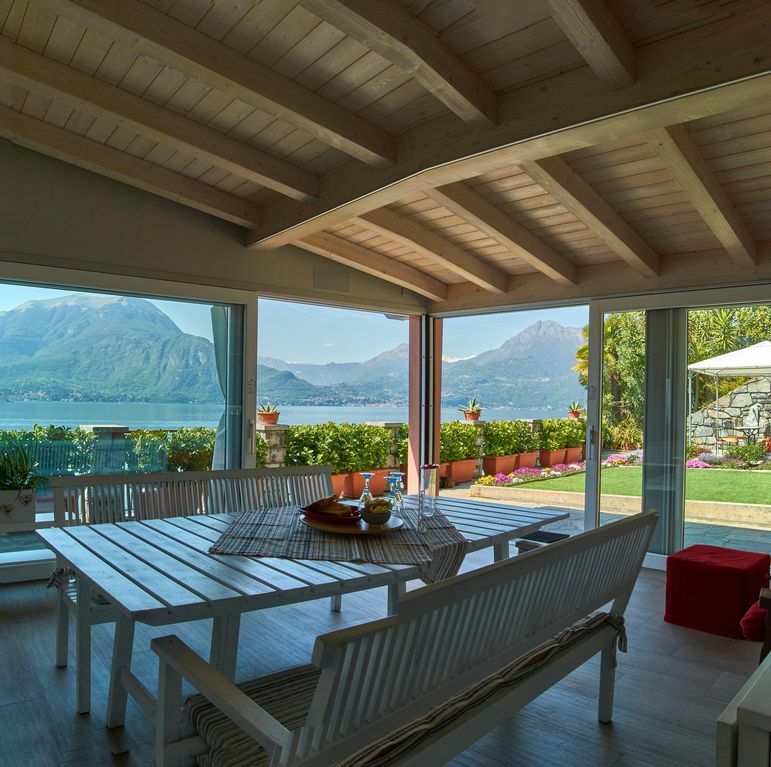 The house is recently renovated, and the pictures do not do the lake view justice! We spent nearly all of our time in the gorgeous sunroom, or out on the lawn. Not only was the house perfect, but our hosts went above and beyond to make us feel at home. They offered to pick us up and drive us to the train station, and they were always available to answer our questions. We would love to stay again!! We're glad that you enjoyed your holiday, we hope to see you soon back on Lake Como! The views are absolutely breath taking. And the house is very, very comfortable. Although the weather was cold when we were there (Feb/Mar) the house was always comfortable. It's easy to find and excellent parking. Varenna is a jewel of a town with wonderful restaurants and easy to access ferry that will take you across the lake. The train station is there to get you to Milan or St Moritz or any other place in Europe. The owners were amazing hosts. They greeted us with wine and snacks and brought homemade treats during our six day stay. Their English speaking son came and briefed us on the house and area and was very accessible by email. He was available to help with issues in the house if needed (there were none), restaurants, ferries, and even told us how to pay the road toll from Milan. Comfy beds too. The only thing we had a problem with, if you could call it a problem, is that their were no paper coffee filters for the American style coffee maker. The large grocery store nearby does not sell them. We were surprised they even had such a coffee maker but the kitchen is extremely well supplied. We made filters with paper towels but Americans might want to bring your own filters. There are Italian coffee makers too so you won't be without but if your preference is American style then be advised that paper coffee filters are rare in Italy. The owners provided enough coffee for three people for six days. There were also basics like salt, pepper and a few spices. The small refrigerator was adequate and had a good size freezer. If you must have ice cubes you might want to throw in an ice tray in your luggage along with the coffee filters. As I said earlier, the views are simply marvelous. We cooked on the grill and enjoyed the beautifully landscaped patio and gardens on the mild days. We had wonderful, sunny weather and though cold, not uncomfortably so especially for being in the mountains. It was colder in Houston. Having a washing machine was a plus. No dryer but things dried quickly on the rack they provided. We absolutely loved the place and sure you will too. This Villa truly offered the most stunning and beautiful views of the alps. The host was away on holiday but his son Giacomo took excellent care of us and answered any questions we had. We were met by a friend of the family when we arrived and in addition to the stunning views and beautiful property, we were greeted with a chilled bottle of prosecco and some snacks which we enjoyed sitting in the yard looking at the glorious view. The town of Varenna was perfect and offered everything we wanted. We had some delicious meals and took a beautiful hike. We drove to town during the day but definitely recommend taking a cab in at night (cost was 10 euros). We did walk the greenway one night to Varenna but it was definitely too long and hilly (and probably too dark) to walk back. The cab drivers knew our host and truly couldn't be any nicer. Make sure you take their cards with you when you go out as you will need to have someone call them for you. There was a little bakery down the street which we visited one day for breakfast. There was a restaurant there as well that had good reviews but we simply ran out of time to try it. Randonnée à la source de Fiumelatte (la plus petite rivière en Italie) et la Barricade (terrasse surplombant le lac) peut également visiter Orrido formée par la rivière Pioverna de Bellano. Visites du château de Vezio, Villa Monastero, Villa Cipressi et les jardins, le musée d'oiseaux et deux églises historiques de Varenna: San Giorgio et de San Giovanni. Ski environ 1 heure, Moto Guzzi d'usine en 10 minutes. une mini-croisière bateau pour visiter la belle ville de Bellagio et Menaggio, avec leurs villas, et de l'île Comacina.